Nikon has developed the all-new M-300 BLK riflescope to maximize the effectiveness of the .300 AAC Blackout cartridge while using both supersonic and subsonic ammunition. Now, shooters have a 30mm body riflescope that can harness both variations of this up-and-coming cartridge. The M-300 BLK is available with an illuminated reticle to give shooters an added advantage during low-light situations. The illuminated reticle can be adjusted to different brightness settings using the push buttons on the eyepiece and has up to 32 different levels of intensity for the orange center dot. When the illumination feature is turned off, the last brightness level is saved. 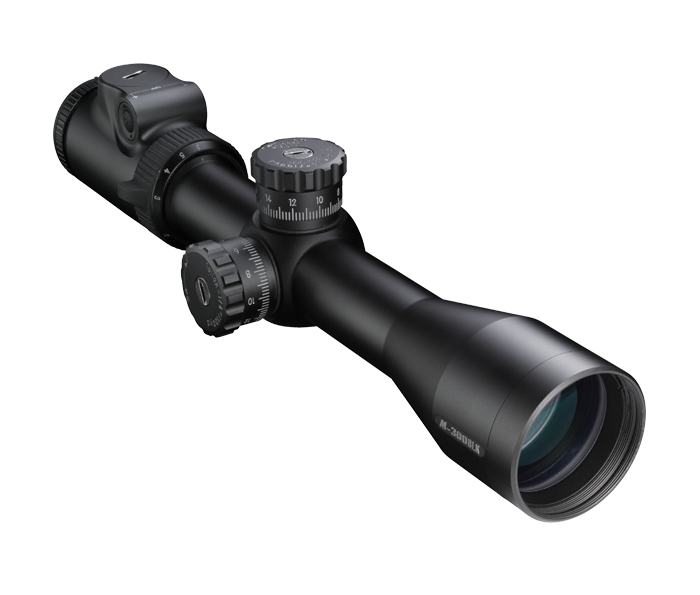 Engineered for minimum weight and maximum strength and durability, Nikon builds these scopes from aircraft grade aluminum alloy and utilizes larger internal lenses for maximum resolution. Larger tubes allow for the best resolution, wider windage and elevation travel, and superior low-light performance. Nikon engineered the entire optical system in the M-300 BLK to provide the shooter with maximum brightness and maximum light transmission. The result is an extraordinarily clear sight picture. To simplify field adjustments, Nikon has integrated this feature into the M-300 BLK riflescopes. Just sight-in as usual, then lift the spring-loaded adjustment knob, rotate to your “zero”, and reengage. Field adjustments are now as simple as dialing-in your subsequent ranges. Reticle adjustments are made in 1/4-inch click-stop moves you can both feel and hear, and with no backlash to make your shot creep off target. Positive click reticle adjustments get you zeroed in quicker and maintain your setting—even with repeated recoil and under rugged conditions. The M-300 BLK, like all of Nikon’s riflescopes, is optimized for use with Nikon Spot On Ballistic Match Technology. Spot On allows you to discover all of the exact aiming points on your scope’s reticle at various yardages for your specific ammunition and load. Nikon riflescopes are covered by a Limited Lifetime Warranty. If any Nikon riflescope is found to have defects in workmanship or materials, we will, at our option, repair or replace it at no charge. Allows the shooter to instantly bring the reticle into sharp focus. Nitrogen filled and O-ring sealed for confidence under the toughest of conditions.